The stylish and effective method in communicating your current specials, menu details or pricing information. Choose from our range for your retail or restaurant environment. Depending on your intended use we have options to suit your pocket. From simple lightweight units to very upmarket polished edge heavyweights. Slanted for single sided visibility or uprights for double sided readability. 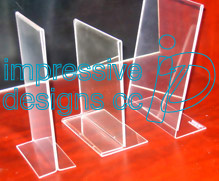 Simply insert your artwork into the unit for ease of use, customer visibility and protection from the elements.